Work to turn a notorious cafe in the St Pauls area of Bristol into houses was due to begin on Monday. 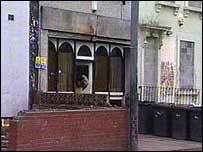 The Black and White Cafe, reputed to have been a haven for drug dealers, was closed in summer 2004. The cafe was closed by police under the Anti-Social Behaviour Act, backed up by a full closure notice from magistrates. It had been bought by the council under a compulsory purchase order. Opened in 1971, a police raid in April 1980 sparked the St Pauls riot. The cafe and other houses in the terrace will be razed to the ground and replaced by around seven new houses built by the Knightstone Housing Association.